I think I have both. Each day lately new updates arrive. Ouch, I obviously have too many apps across a variety of platforms. Yesterday my ipad indicated there were 43 apps to update. Google pushed all new versions of its 11 apps to the Android phone and now on opening the Play store there are 5 more waiting to be updated. App and program developers keep us moving on too. Evernote has a new web interface, so does Ancestry. Dropbox has added some features, Facebook is forever changing its layout and settings. September has been an unusually busy month for updates. Okay, so what is outdated? I've had a trawl through the apps on my devices and deleted those rarely used. Sometimes it is easier to just use the web interface rather than a specific app. For Facebook I always prefer the web version so goodbye to all those apps. Diigo is great for bookmarking, but a separate app, no thanks, I've got the bookmarklet installed. Pinterest annoys me with its insistence on updating the app every three weeks. Give us a break please, I'll only be using you on the laptop from now on. How many document scanners does one really need? Scanner Pro, Text scanner, Scanner+ CamScanner and Evernote Scannable. What about note apps? Evernote will stay but 2Do, Metamoji - - can't even remember its original name, and some others have gone. How many calendar apps have you tried, yes, I deleted 3! Whew, feeling better already. Then there's the range of web browsers, the photo editing apps and the image makers like the one below. How's your updating progressing? Just couldn't get rid of this old favourite - Wordfoto. This week while exploring some newspapers in Trove I came across an article which puzzled me. 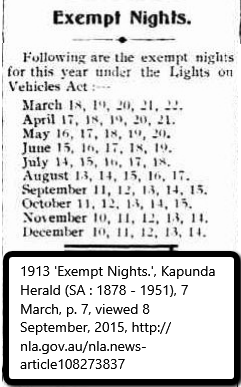 Why would vehicles be able to travel at night with no lights as indicated in this snippet from the Kapunda Herald? This was 1913, so think horse and buggy. I could not imagine why a vehicle would need to be exempt and indeed why on particular nights. On looking more closely I could see these exemptions were approximately one month apart and lasted for five nights. A quick search for the "Lights on Vehicles Act" explained it all. These were the nights leading up to and including full moon each month. The Act had been brought into force in 1872 in South Australia and reluctantly applied across country towns in the ensuing years. The 1877 article below explains an ingenious monetary reward method for getting the law enforced. The newspapers report many court proceedings for infringement of this Act. Love thy neighbour, but if you need money and he doesn't have a light here's a quick earner! Act 33 of 1876 extends the provisions of Act 16 of 1872 by making them apply to all main roads in the colony, and streets and cross roads within 50 miles of the city of Adelaide, and 10 miles of any corporate town. It was enacted that all vehicles while travelling on the roads or streets indicated, between half an hour after sun down and half an hour before sunrise (four nights immediately preceding the night of the full moon, and full moon night alone excepted, shall be provided with at least one proper lamp, which shall be kept burning. It is also enacted that any vehicle left or placed upon any such street or road after sunset and before sunrise shall be provided with a light on the side nearest the road. The penalty for a breach of the Act is a fine not exceeding 40s. half of which shall be paid to the person laying the information, and half to the Corporation or District Council within whose limits the offence may have been committed.